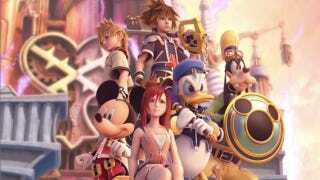 At this year's Tokyo Game Show, Square Enix announced a high definition remake of the first Kingdom Hearts, Kingdom Hearts Re: Chain of Memories, and Kingdom Hearts 358/2 Days. It's called Kingdom Hearts HD 1.5 ReMIX. In the upcoming leaked issue of Famitsu, Kingdom Hearts designer Tetsuya Nomura was apparently asked whether or not there would be a HD remake of Kingdom Hearts 2. "It would be unnatural if there wasn't one," he replied. Nomura, of course, didn't say if and when said remake would happen—if it actually does happen. Still, don't act too surprised when Square Enix announces the inevitable high definition remake of the 2005 PlayStation 2 classic. Act happy.